The Writeous Babe Project: Can You Write Your Life Into Existence? I'm a girl obsessed with goals. I write yearly goals, monthly goals, and even goals for the week. But so often these goals get lost in my litany of daily tasks. When my daily to-do lists and my lofty aspirations go head to head in battle, the to-do list wins -- always. Then I think of Octavia Butler, the black woman warrior writer who, as Kiara Collins so perfectly stated in a recent article for Blavity, "literally wrote her life into existence." Within her personal journals, Butler boldly declared that her novels would be a success, that she would be "a bestselling writer," that her books would be "read by millions of people" and that she would help "poor black youngsters" by broadening their horizons. Sooner than later, Butler found her affirmations became her reality. Following the success of several novels including, Mind of My Mind, Clay’s Ark, and the widely recognized, Kindred, she went on to receive a spot among the best-seller lists and be a renowned novelist with awards and accolades including becoming the first science- fiction writer to receive a grant from the MacArthur foundation, a Lifetime Achievement award, and induction into the Science Fiction Hall of Fame. And these affirmations proved to be the catalyst she needed. Butler ended her affirmations with "So be it. See to it!" as if she were telling both herself and the Universe - "OK. This is the plan. Now let's get to work." What about you? What about me? What will we do to honor Butler's boldness? Collins describes Butler's written affirmations as a "verbal vision board." I like the sound of that. So this week I'm creating one of my own -- a list declaring what I shall accomplish in my writing life. I may write this list in my favorite notebook or planner or put it on pretty paper and post it on my office wall. But I will create my verbal vision board and I will read it every night as if it is my daily bread. If you decide to create a verbal vision board of your own as well, I'd love to read all about it. 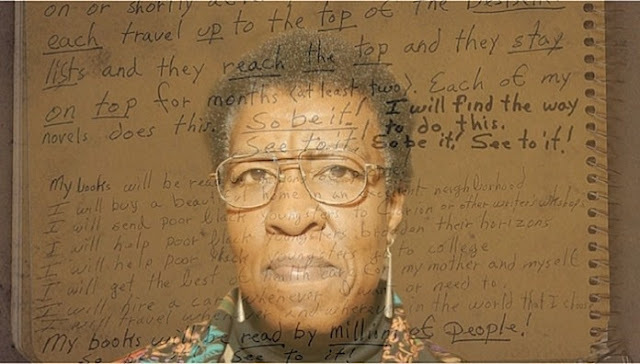 I too read the article about Octavia Butler on Blavity and was blown away on how she spoke her life into existence. I was so inspired because I've been affirming what I want for my life on a daily basis and I find peace knowing that one day my dreams will be my reality. Thank you so much for stopping by my blog and sharing your story. It's exciting to know other women are writing and speaking their dreams into existence, too. And you are so wise to affirm what you want for your life on a daily basis. Keep dreaming and keep grinding!